I’ve updated one of my favorite muffin recipe into a gluten-free version! 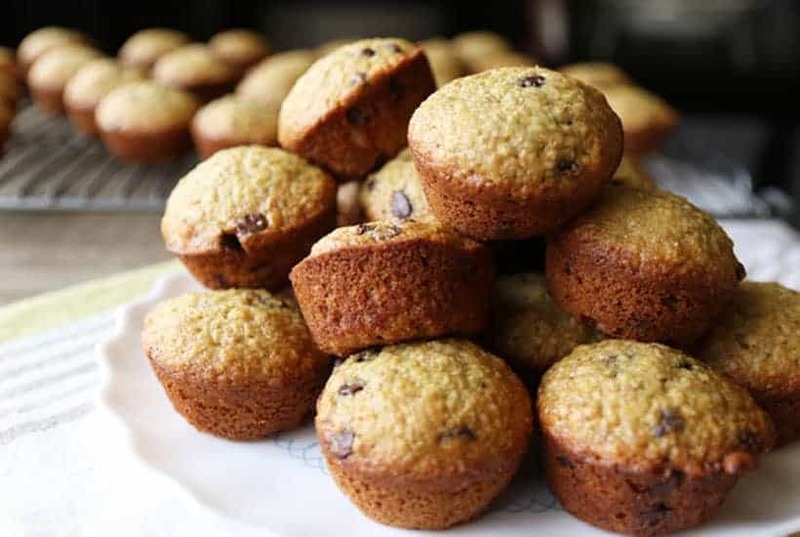 These Healthy Banana Muffins have been a staple in my house for quite some time. They are still just as easy to whip up as before and of course they’re still just as delicious! In a bowl, mash the bananas with a hand mixer. Then mix in the wet ingredients. Fill a greased muffin tin and bake! See? So quick and easy! That’s why I love this recipe. When I was converting this recipe to be gluten-free, I really wanted it to be just as quick and easy as my old version. So much of gluten-free baking feels daunting. Sometimes I just don’t want to pull out 5-7 items just to mix up the dry ingredients list. Ain’t nobody got time for that! So that’s why I use a baking mix, Pamela’s baking mix to be exact. I’m not kidding that we all love these Healthy Banana Muffins. 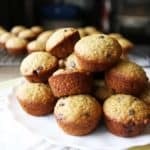 My daughter saw these photos and asked, “when can you make those muffins again?” So if you’re feeling like you need a little something healthy in your life but also like chocolate to go with it, give these banana muffins a try. Or if you’re like me and you love fooling your children into eating things like ground flax, I’m ok with that too. ???? 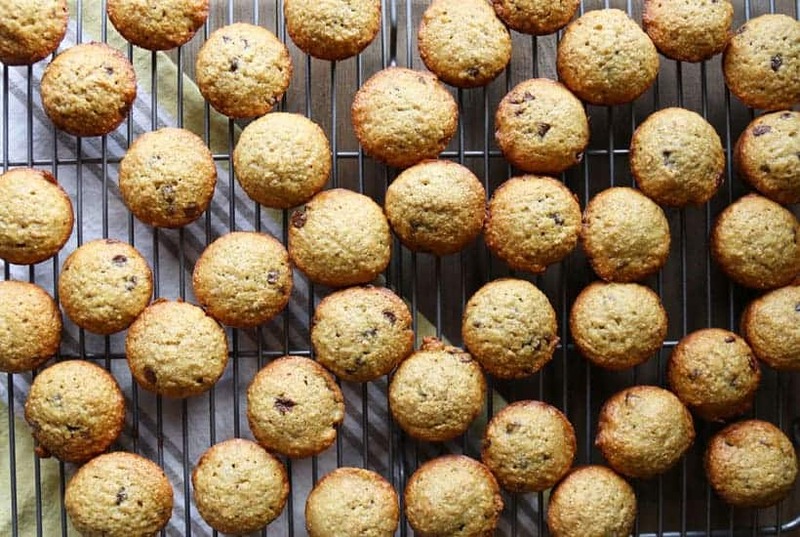 These banana muffins are banana-y, chocolate-y, and nutty-ish. Also deliciously healthy. Preheat oven to 350 degrees. Grease 2 - 24 cup mini muffin pans. In a bowl with a hand mixer, mash the bananas. Add the sugar, oil, vanilla and egg. Beat until combined. Dump the dry ingredients on top. Mix in the dry ingredients until just combined. 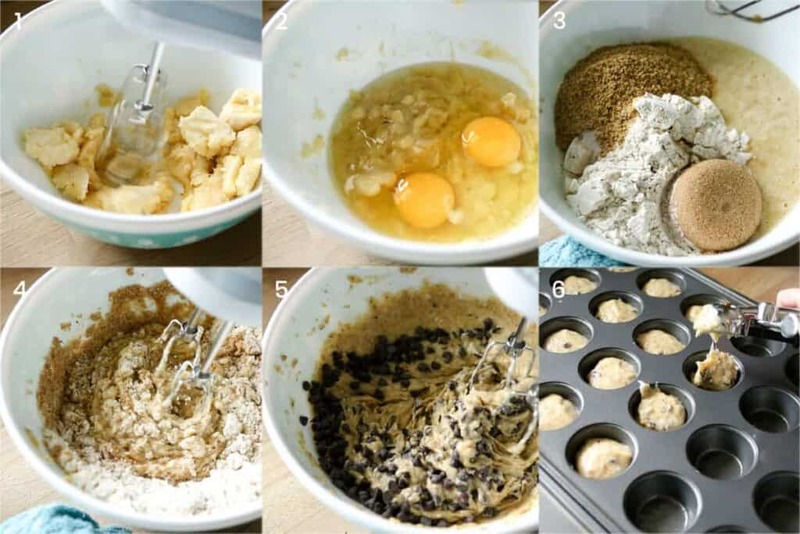 Fill generously greased muffin pans with 1 tablespoon of batter. Bake 15 minutes or until a toothpick comes out clean and muffins are a nice golden brown. Cool in the pan for 5-10 min before turning out onto a wire rack to finish cooling. Enjoy! Here’s another awesome recipe I made with Pamela’s baking mix, two-ingredient bagels! And here’s the everything bagel spice blend for those bagels! These look delish and I happen to have a couple ripe bananas!